The model #720 has a solid oak straight back with traditional style cap rail, and solid oak, deeply contoured seat. 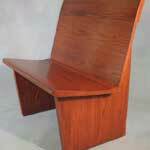 It can be equipped with a variety of pew ends, or incorporate an endless design for a more contemporary look. Pew body #720 Bench - shown endless. 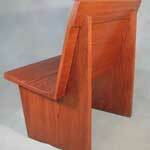 The model 740 is one of the most comfortable hardwood pews made. 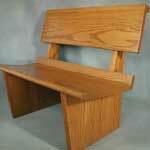 Marshall’s exclusive “ShoulderRoll” solid oak pew fits literally everyone. Whether you are tall or short, sit up straight or slouch, the “ShoulderRoll” provides you with comfort and support. 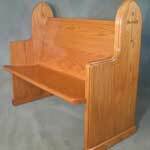 Most curved or contour back hardwood pews fit only certain sizes or shapes of people – and then only when one sits up perfectly straight. Our “ShoulderRoll” design is the answer. The model #740, with the same solid FAS Northern Red oak back and contoured seat as our other hardwood models, but with the Marshall exclusive “ShoulderRoll” cap rail design. The Marshall exclusive “ShoulderRoll” cap rail not only has a contour molded into the face, but is attached to the back at an angle for added comfort. 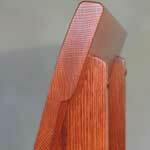 The pew supports are attached directly to the cap rail for added stability. 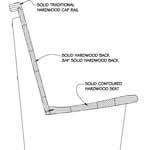 The “ShoulderRoll” cap rail is available on all of our pew models.